When the shipment is too big for courier service, it’s time to call Cincinnati’s emerging leader in reliable freight services. Cincy Errands balances speed, safety and competitive pricing to fuel our customers’ success. 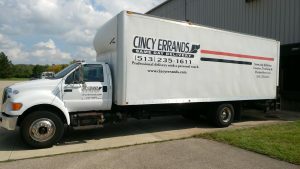 Freight moving from origin to destination is no accident: Cincy Errands’ drivers are careful, experienced, and always professional. Call us today at 513.235.1611 for a Midwest / Cincinnati freight quote.